The safety of your pooch is paramount whether you’ve got a pup or an adult or whether you have a highly intelligent breed or otherwise. When you’re out and about on a walk you can keep an eye on him or her or them with your own eyes or even with a tracker, but how do you know they’re ok when you’re not there? It can be difficult leaving your dog alone at home not knowing what they’re up to and if they’re OK. Thankfully, with the use of modern technology, it’s possible to keep an eye on your dog remotely or to review their goings-on during the day. Not only that, it can also be used as evidence if you (god forbid) got robbed. Yes, they are dog cameras! Do I need a dog camera? Here’s a handy table for you to view our shortlisted dog cameras to save you some time. SEE -- 1080p Full HD Camera & Night Vision: With Full HD, 160º wide-angle, 4x zoom and night vision, you will be able to see your dog clearly day and night. TALK -- 2-Way Chat & Barking Alert: Furbo will notify you when it senses your dog barking. Know what's going on at home and talk to calm your dog down. PLAY -- Fun Treat Tossing: Play remotely by tossing treats to your dogs via the free Furbo iOS/Android app. Fill Furbo with over 100 pieces of your dogs' favourite treats & play a game of catch. Recommended treat size: 1cm. 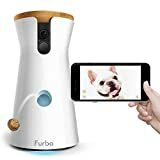 SHARE -- Take photos or record videos with the Furbo app. Share the precious moments with friends and family. Well, first of all you’ll notice the camera is shaped like a dog which is a bit of a novelty for the owner as the dog won’t care. Second, is that the IP Camera has premium level features at entry level price (it’s usually on offer). 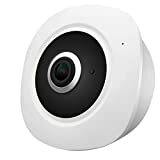 Full HD viewing for a crisp and clean pi, wide angle camera so you can se the whole picture as well as motion detection which makes it double up as a security camera and SD card video storage make this a very good choice if you’re on a budget but want something more than “just” a camera. Doesn’t have dog specific features though unless you count the fact it looks like a dog. Partial night vision lets it down a bit slightly. ✅Full HD Video: It will present you a face to face visual effect with 4 times digital zoom, HD 720P, and noise-reduction technology. Built-in powerful IR-LEDs for night vision up to 10-15m, you can see clear in night. ✅Wide Viewing Angle: With remote pan/tilt, 355° horizontal and 120° vertical rotation range makes you see all corner clearly. Remote access, no matter how far you are, you can view the wireless security camera via phone/ipad/PC. Support different smart devices access at the same time. ✅Two Way Audio &Motion Detect Alert: With built-in mic and speaker, remotely talk and listen. Talk to your family members, tell your dogs, warn the thief etc. 24-hour guard. Support real-time push notifications. Support micro sd card recording and playback, never miss any important minutes. 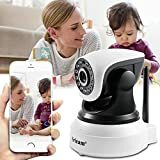 ✅Stable Connection to 2.4G WI-FI:This IP cam only supports 2.4G WiFi, can't supports 5G WiFi. Most routers has 2 different frequencies. 2.4GHz (which is better for covering more distance) and 5.0GHz (which is typically better speed). You can simply login to your 2.4GHz network to finish connecting. If you can't connect the camera, please press reset button 10 seconds to Reset it and reconnect. The Pet Fun feeder is a serious contender for the title of best feature dog camera if only you could make some sense out of the description the company has given on the various shopping destinations. Anyway, we’ve managed to get our hands one of these bad boys thanks to Pet Fun and we’ve been able to make up our own mind and description to help you guys make an informed decision. First of all, this feeder looks modern and snazzy and would contribute to an interior decor for any home – this is a huge plus point to us in JugDog and we believe any decent dog camera should look good. 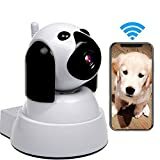 For features, it has an easy to use app for iOS and Android that allows you to see your pooch in real time with a crystal clear picture (720p to be price) at a wide 130 degree angle. It’s not 360 which does let it down a bit but not too many are 360 and they are tricky to install. With the app you can take images, record video for storage and it allows for two way audio. Lastly, possibly a bit gimmicky but nevertheless a feature you might like is custom music for when it’s time to feed them automatically. This could be great to associate music with feeding time if they’re not in the view of the camera. The feeder part can allow for up to 4 set meals which seems a bit overkill considering you shouldn’t be away for your dogs for more than 6 hours and 4 set meals in 6 hours is way too much for them to eat. However, 4 small meals could be good but doesn’t let your dog settle much as they should really be sleeping for most of those 6 hours. This feature struck us as something a non dog owner would want. Still, you don’t have to use it. The price point for the Pet Fun feeder is excellent when it’s on offer which it often is. Considering all the features it has it should definitely be at the top of your list of strong contenders. However, there are some daft additions and it’s fairly new which means there is a lot less reviews for this one that maybe some of the market leaders. 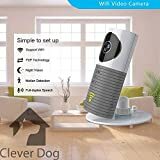 The clever dog smart camera is an excellent entry level dog monitoring camera that has many of the ideal features listed here. It’s not the best looking thing on the internet and you may want to hide it when not in use but for what you need it to do it is great. The picture is clear and you can connect via Android or iOs app. The drawbacks? the movement sensor will drive you crazy as it can pick up on changes in light and you may want to turn that feature off. The Maudpower Dog monitor security webcam is actually designed for babies but can be repurposed for your dog. It has the very standard of features as a web cam and pretty much no features specifically for your dog. As an entry level camera though that is to be expected. Highlight is the ease of installation even for ‘olds’ as the Amazon description will tell you and the high definition camera and two way microphone. It is quite a subtle webcam as well which means it won’t disrupt your home decor. ♛【 QUICK WIRED/WIRELESS NETWORK CONNECTION 】: http://www.sricam.com/videos.html, about installation, you can refer this website. Scans QR Code on the user manual, then on the popup page choose your suitable app: Camhi or PC client for easy setup. Other feature like Motion Detection, Email Alert, Screenshot etc. Also one camera can simultaneously send push notification message to 3 different phone so no any worries about message delay. ♛【 CONNECTIONS FOR YOUR SMART LIFE 】: Remote Control via Smart Phone, rotation Horizontal angle 355°; Vertical angle 90°. Records video clips when there any motion events detected. You can also remotely view live video from Smart Phones, iPad,and PC. Protect your property - day/night surveillance with IR. ♛【 PROFESSIONAL HOME SECURITY SOLUTION 】: It offers exceptional video quality and audio, whether at home or in the office. you can keep a watchful eye on your home or business at anytime and from anywhere.Full HD 1280 x 720 High Definition WIFI Camera. Works Anywhere Within Your WIFI Coverage. Again, the Weesee Wifi CCTV camera is not a built-for-purpose dog camera as is more likely when you are looking at entry level stuff. Has no dog specific features but what it does have is a crisp feed and an incredibly low price! Adjust the angle however you want and with a 360 view you can see everything, along as it’s positioned right which may mean some unwanted DIY is needed. This product is HD Wireless Wifi VR IP Camera with 360° full view and 3 megapixel, makes new vision and more wide world. It has the function of electronic PTZ, allows you to adjust the monitoring pictures freely and choose the angle you want through the phone APP. Suitable for office, home, factory and some other places. 360 degree 1.19mm lens panoramic IP camera would make wider surveillance without blind spots. Standing full HD 1536 * 1536 high display resolution, electronic zoom function makes the details clear. Share camera videos to your friends or family on smartphones, PC, tablet and more. The Automatic Smart Pet Feeder from VGSION is a whopper. With this you can feed you pet at any time and from anywhere or set a timer to do it. This is way more than just the camera hence the premium tag. With a 130 degree camera, dual audio channel and massive amounts of remote storage available this has everything you need to solve your smart pet camera needs. Does require mains power as many do but that’s not a surprise as all these features simply can’t be done on batteries, an added bonus is social media connection to share your moments – although god knows why you’d want to really. Night vision is not in this model which does let it down though. Unfortunately this product is no longer available but we will bring it back if it does. 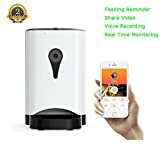 This is a real smart choice for those who want a premium dog camera without the treat dispensing or feeder features and a camera that will fit in with existing house decor. This is a real flash piece of kit. What separates this from the competition is its ability to rotate so you can really see everything if its positioned well. The PETKIT camera also has dual way microphone so you can communicate with your buddy and have high quality HD video recording to keep an eye on them. As an added bonus it has day and night mode to keep you connected no matter the hour. Lacks external storage though. multifunctional remote pet monitor: two way chat, hear and comfort your dogs just like you are right there with them. pet kit has built-in microphone and speakers. 340° Rotatable pan and night vision, lets you see your entire room, day or night. Easy & Safe: Day mode and night mode automatically converted, Easy to use! This fancy looking today is different as its got a laser which can distract and stimulate the pet, however for a dog I’m unsure how many would be able to play with the laser without destroying everything. As you can see it’s also a good looking device which won’t be an eyesore and you won’t feel the need to put it away when not in use. Other than that, it has a HD camera with a 3x zoom, 138 degree viewport and two way audio for communication. This could be a hit or a miss with your pet if you’re willing to stump up the cash for it. WATCH: 720 HD video with a 138 degree wide-angle view, night vision, and 3x digital zoom. TALK & HEAR: get your furry friend off the couch and hear what's going on with two-way audio. You may think that a dog camera is just a normal CCTV camera but with the word ‘dog’ attached. Well, technically you could get one of these but real dog cameras available in the UK can be interactive and are specifically designed for the use of keeping an eye on your dog. Generally a dog camera has a microphone (both ways), can dispense treats and some can have night vision for when you’re out during the night or they’re in a dark room. A common feature of canine specific cameras is an app for the owner to check in with their furry friends. The short answer is no, you don’t need a dog camera at all. A pooch monitor is merely a tool to make owners aware of how they’re dog is doing alone and to be able to interact with them if they have one that has that feature. An added bonus for a dog camera is it can also put your mind at rest about your home in general regardless of how your dog’s doing. All in all, a dog camera can be very handy for those who are in the middle of training their dog to be alone. A dog camera also provides a layer of general security around the house as it’s not just the dog you can keep an eye on but your house/possessions too. A dog camera, by extension, an also keep an eye on your cat and other pets if you have one. Dog cameras are great and you may need one if you feel anxious about leaving them alone all day or even all night. Even with a dog camera you till shouldn’t leave them alone for too long so please remember that. They are social animals and speaking down the phone and tossing them a treat (if you have a dispenser) is no substitute for proper socialising.